You can also see my post from the HATE blog tour, by clicking here! Published 10th April by Indigo books. Goodreads Synopsis: Eve’s older sister, Rosie, was bright and alive and always loved being the centre of attention. Then one day, she is brutally murdered. Six months later, Eve meets Antony and discovers that he was there the night Rosie died and did nothing to help. Is there any way she can ever get past that? Inspired by the Sophie Lancaster murder in 2007, which saw Sophie and her partner Rob viciously attacked in Stubbylee Park, Bacup, Lancashire because of the way they dressed. This is a hard-hitting real-life thriller about friendship, courage, loss, forgiveness and about our society and communities. My Review: The real-life inspiration behind HATE really shocked me. It’s terrifying to hear stories of hate crime. I started HATE nervously; how would it treat the topic? How would I find a story, that takes such a serious real-life inspiration? Luckily, I found it really well written. HATE was gripping and eye opening- I read the whole book in one sitting. HATE’s centered around Eve, whose sister Rosie was killed by a gang because of the way she dressed. One day at school, she recognises the name of the new boy, Anthony Ward. He was one of the witnesses that day, who saw Rosie but did nothing to help… and now at school, tension is rising between one character who speaks up and another character who hates him because of it. 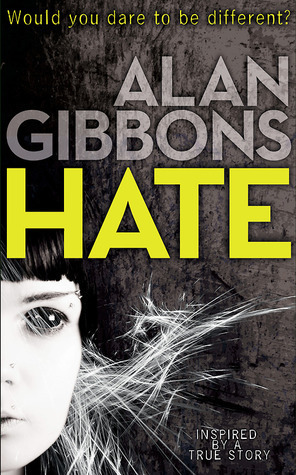 HATE is quite a short read, no more than 300 pages, but its plot is quite complex. It did take me quite a few pages to grasp the format, because it switches between six months before the present events in the book, and between the present tense narratives of Eve and Anthony. It did take me a bit to grasp everything about the characters, too, but after a few chapters I became completely engrossed in the story. The plot is terrifying, made even more so, as it’s based on shocking true events. It really paints a realistic picture of the grief the victim’s families go through, as well as showing how hate crime can be caused, using homophobia and its effects for the central plot of this book. It’s a very tense book, and very heart-breaking, though at the same time, heart-warming at the end. Overall, HATE was a very tense, riveting and compelling read. It’s based around a scarily real topics such as homophobia and hate crime, and it’s not a book that can be forgotten easily. The characters felt three-dimensional, and Alan Gibbons’ writing is brutally honest and powerful. I felt the ending was a little bit abrupt, and the format was a little hard to get used to at first- but it’s most definitely worth picking up a copy of. HATE is a brave, and powerful read. I received a copy of HATE from the publisher, in exchange for a review. In no way at all did this affect my thoughts. This entry was posted in Uncategorized and tagged contemporary, crime, drama, inspired by true events on May 5, 2014 by keithbwalters. Great review Georgia! I definitely agree its not an easily forgotten book. I found it really raw and gripping too. Thanks! It definitely was. I’d love to read more like it in the future.